The South Fraser Blog: July 25, 2016 Council Meeting Notes: Part 2 of 3. New Development Projects, Business Retention & Recruitment Strategy, and Arts Project approved. July 25, 2016 Council Meeting Notes: Part 2 of 3. New Development Projects, Business Retention & Recruitment Strategy, and Arts Project approved. Yesterday, I posted about the changes Langley City Council approved to regulate thrift stores and donation drop off bins in the community. Today, I’ll be posting about two development permits, and committee reports that council adopted. 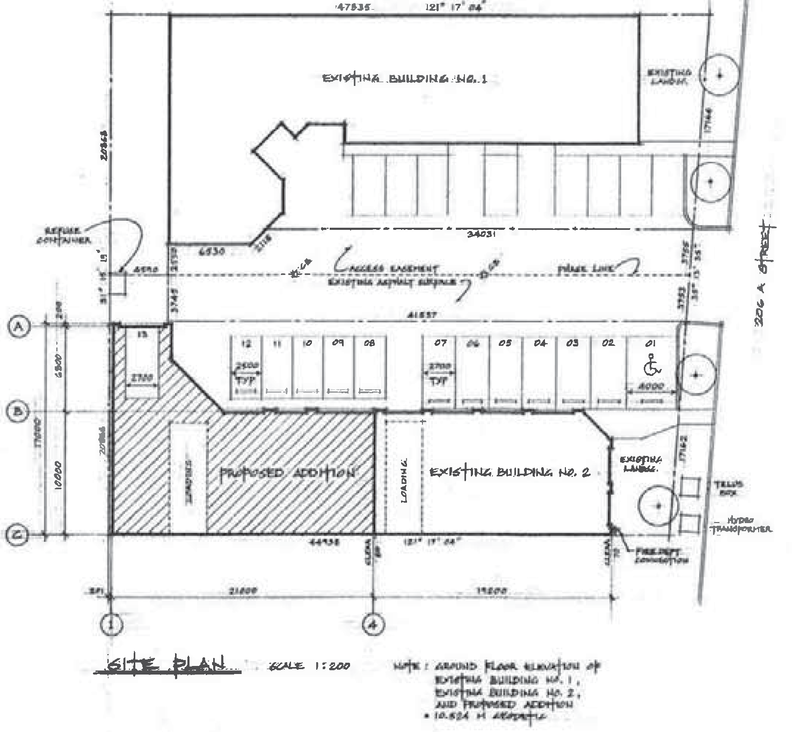 During the Committee of the Whole on Monday, the proponents who were seeking a development permit for 5967 206A Street gave a presentation about their proposed project. The permit was to allow the completion of the final phase of an industrial building complex. The first phase of this project was completed in 1994, and the second phase was completed in 2001. There was a previous development permit issued for the final phase, but it expired. This final phase includes a caretaker suite plus a warehouse. The following drawing shows the final phase in relation to the rest of the project. Approved final phase addition in hatched area for 5967 206A Street. Select image to enlarge. There was no public comment on the project during the Committee of the Whole, and council approved the development permit during a later part of the meeting. 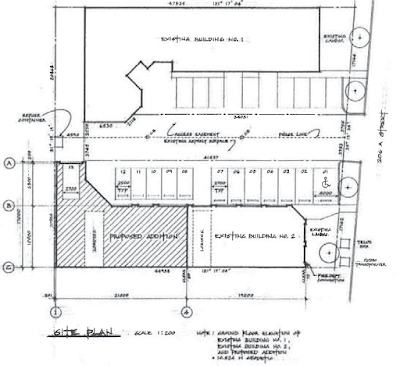 Council also gave final reading for a rezoning, and issued a development permit to allow the construction of a 21 unit townhouse project at 20721/20725 Fraser Highway. I posted about this project previously. Ensuring that we are investing the public realm and amenities (streets, sidewalks, lighting, underground infrastructure), plus expanding events and festivals throughout Downtown Langley are my top two priorities. 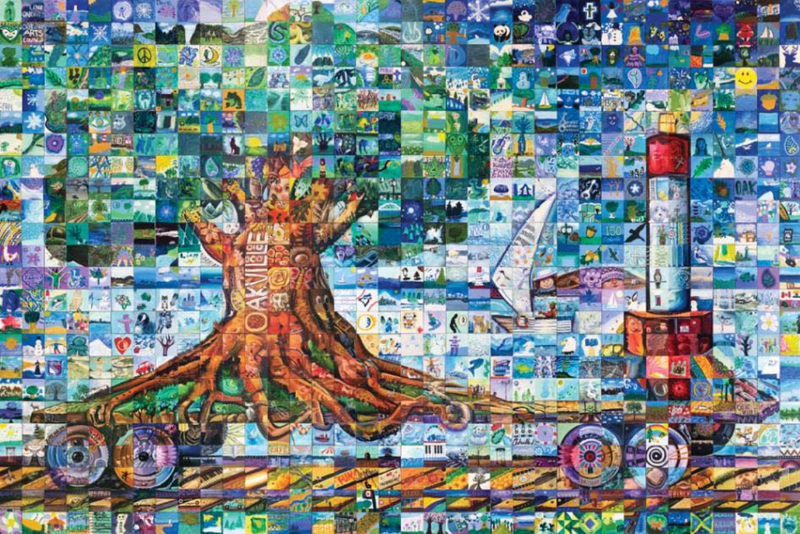 The City’s Parks, Recreation and Environment Advisory Committee put forward a recommendation that the City participate in the Canada 150 Mural Mosaic project, and that the location of the mural be permanently placed in a visible location in the community. As part of the Canada 150 Celebration, 150 communities will create 150 murals that represent each of the respective communities. These murals will be linked virtually to create an image of a train. The following is an example from Oakville, Ontario. Example mural mosaic from Oakville, Ontario. Select image to enlarge. The creation of the mural is a joint project between professional artists and community members. I believe it will be a great opportunity for people in Langley City to be involved in celebrating Canada's 150th. Council approved the recommendation from the Parks, Recreation and Environment Advisory Committee. Council also heard a presentation from Cliff Steward who is the VP of Infrastructure at Vancouver Fraser Port Authority. He gave an update on the port and its values. You can read more about this on the port’s website. While the Port is vital to the economy of our region and Canada, there are some negative impacts from its operation. In Langley City, the high volume of trains cause major delays on the Langley Bypass, Fraser Highway, and 200th Street. The overpasses built along the rail corridor in Langley City were meant to mitigate some of the impacts from increased rail traffic. The Port was a funding partner in the overpass project program. During the presentation, Steward noted that 200th Street was a candidate for a future funding partnership to build an under or overpass. I asked him about Fraser Highway, and he said that it was not on the table. There are some concerns about port activities that could be harming human health. Coal dust and diesel exhaust from locomotives are a few examples of concerns as it relates to the health of people who live in Langley City. Others on council plus myself asked about the health impacts of port traffic, and if the port would do a human health assessment for the whole region. We were told this is something that is not currently being planned. There was also some questions from members of council if GHG emissions from the Port’s activities would be factored into the environmental review of the Roberts Bank Terminal 2 project. Steward noted that with the change in federal government, GHG emissions were now part of the current environmental review for the project. He also noted that they are working to improve the standards required for trucks that are allowed to access the port to reduce the amount of trucks, and improve the environmental performance of trucks. Tomorrow, I’ll be posting about the administrative reports and council motions from Monday’s meeting.